Getting a body piercing is extremely exciting and chances are, you’ve been thinking about what you want for weeks, months or even years now. If you’ve finally decided to go through with it, we at Almost Famous Body Piercing are just as excited as you are! Even if you have a dozen or more piercings, a new one is always exciting. Where you get your piercing and what kind of jewelry you choose are highly important as well as the aftercare that you use on your new piercing. 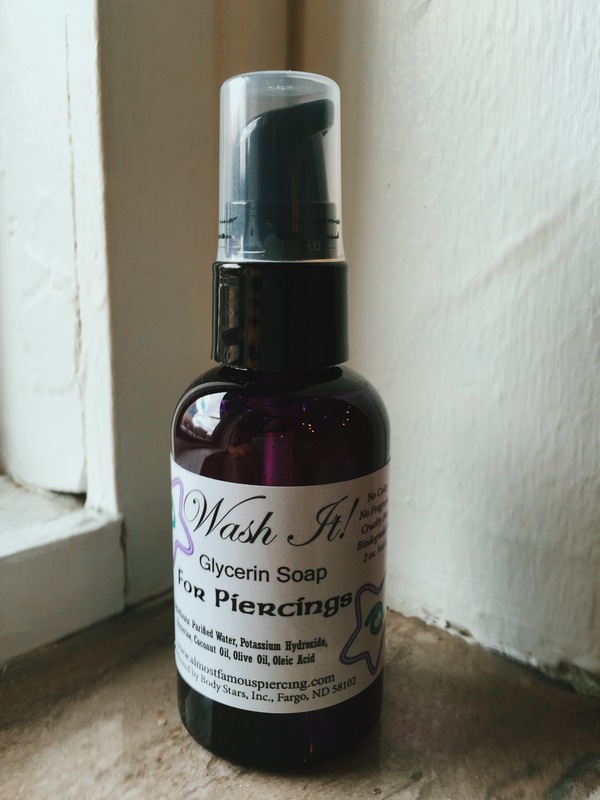 Keep reading to learn more about body piercing aftercare and your new secret weapon when it comes to keeping piercings clean and on their way to healing – vegetable glycerin soap. After the piercing procedure, your piercer will go over healing and aftercare guidelines. This includes signs of infection, things you want to do/things you want to avoid, normal signs of healing, and how to use the products that you will take home to clean your piercing. We also give you an aftercare pamphlet with all of the same information to refer back to if needed. After a piercing, the skin around that area can easily become irritated or inflamed, so you don’t want products that are harsh and that are loaded with perfumes, dyes and abrasive cleaning agents. Instead, you want to use items that are made with gentle, natural ingredients. Vegetable glycerin soap is simply made with a handful of ingredients that include coconut oil, glycerin, olive oil, and won’t irritate your skin. Not only is this soap good for piercing aftercare, but it’s also an ideal everyday choice for people prone to skin irritation, redness or itching and can be used as a regular face wash.
Not all soaps are created equal, and when you’ve just had a piercing done, you need something incredibly gentle for your skin. The gentle nature of glycerin soap is really the biggest benefit for people who have just received a body piercing. Everyday soap or antibacterial soaps can be too harsh to use on a healing piercing and can be extremely drying to the skin. Vegetable glycerin soap is hypoallergenic and is derived from plant sources. It is also a humectant meaning it attracts moisture to the skin. While doing aftercare, the goal is to keep your piercing and the jewelry clean by removing any discharge from the area so that it can continue to drain throughout the healing time. This is a necessary and normal part of healing any piercing wound. Using the glyercin soap is as easy as using hand soap or body wash. Just put 1-2 pumps of the glyercin soap into your hand and work into a lather. Then gently wash around your piercing(s) and then rinse your piercing under a stream of water. 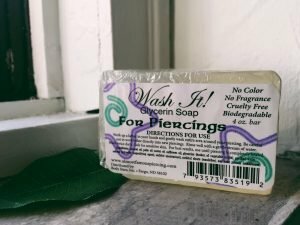 You want to clean your piercing with the soap 2-3 times a day for the entire healing time. Contact Almost Famous Body Piercing to learn more about aftercare procedures for your new piercing. You can also check out unique artist portfolios and find information about getting a new piercing. You can purchase glycerin soap as well as non-iodized sea salt and essential oils at any of our Almost Famous Body Piercing locations or from our online shop.